Early Sunday morning, Saline County Sheriff’s Office (SCSO) deputies responded to the 1100 block of Brookhaven Court to assist medics. Upon arrival, one victim was being treated for a facial laceration by Lake Norrell Fire Department personnel. Upon interviewing several parties present, it was determined that a verbal argument became physical and the victim was allegedly assaulted by Daniel Cantwell. The victim was transported to a local hospital and his injuries were non-life threatening. The victim was discharged later that morning. Cantwell will go before a District Court judge on Monday, 18 September 2017, and a bond will be set at that time. 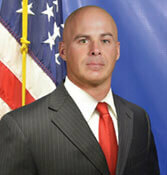 Cantwell is employed with the Pulaski County Sheriff’s Office as a Patrol Deputy. The SCSO is working closely with the Pulaski County Sheriff’s Office and this investigation is currently ongoing. Regarding any action taken by Pulaski County Sheriff’s Office regarding this matter, questions should be directed to that agency.